"A medium-hot chili seasoning. Add to chili in place of store-bought packets. Add more or less cayenne to adjust heat/spiciness." 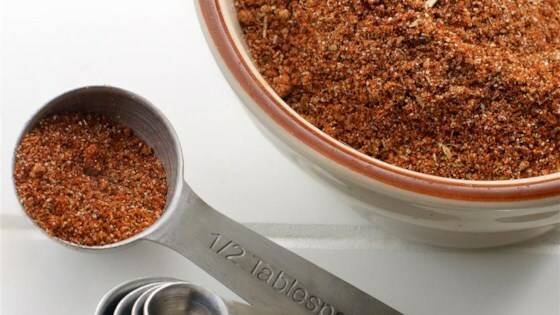 Mix chili powder, cumin, onion powder, paprika, garlic powder, salt, onion powder, oregano, brown sugar, cayenne pepper, mustard powder, coriander, black pepper, cinnamon, and bay leaves in a bowl. Store seasoning mix in an airtight container. Onion powder is listed twice. Is this correct, a typo or is there truly supposed to be 6 teaspoons of onion powder? Recently made chili with this seasoning mix. It was out of this world delicious. I substituted white sugar for the brown and left out the cinnamon. I also added a bit of ancho chili powder as well. Great combo of ingredients! Thanks! We add a pinch of cocoa powder and reduce chili powder by abt half. No more packets in this house! Excellent chili seasoning. I used 4 lbs meat, 1 onion, 1 can tomato sauce, 1 can diced tomatoes, 1 cup water and 1 can black beans. Also only used 4 tsp. onion powder. Salt to taste. Better than the store bought packages and I know exactly what was in it. Thank you for the recipe.